We have a new challenge which starts today at Crafts Galore Encore and one of our sponsors is Star Stampz (the other is ppinkydolls.) 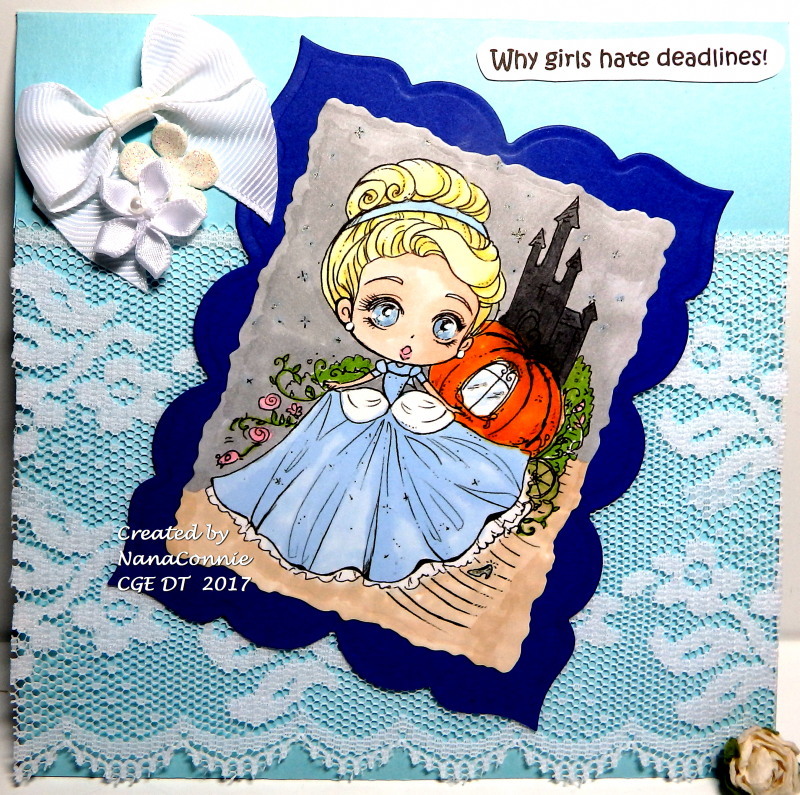 I couldn't wait to color up this adorable Cinderella by Star Stampz. She looks so distressed at losing her glass slipper, don't you think? It couldn't possibly have anything to do with the clock striking midnight, right? This is just an adorable image and gorgeous card Connie! So pretty! I love the lace on this and that pretty image too. Hi, Connie! I love the image you used! Great card! Thank you for joining us at Crafty Creations Challenges. Stunning work my friend, beautiful image! I love the personalization you took with your comments on your work, so fun! Thanks for sharing your talent over at Penny's Paper-Crafty Challenge! OH! Love the lace and the sentioment is SO true, love the image with it. Beautiful card NanaConnie with a fabulous image and wonderfully coloured! Really like the lace background!